While I was in Mumbai and traveling further, I terribly missed Delhi-NCR for its food. And now when I am back, I am back to my real business. Being in the city means that I go around discovering new places to indulge. 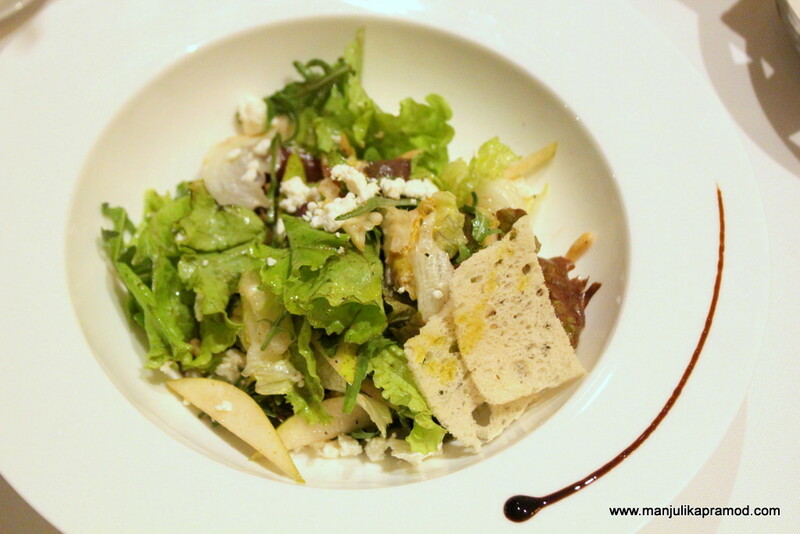 My latest find is ‘Artusi Ristorante’ at 1 Horizon on the Golf Course Road, Gurugram. I visited it two weeks ago and here is my first hand experience. Exceptional is the word that encompasses every aspect of the ‘Artusi Ristorante’, an Italian fine-dining restaurant at Gurugram. The ambiance is warm, the decor is stunning, the staff is friendly but the food that is served here is top notch. It is the real game changer and enhances the reputation of the restaurant by manifolds. Every morsel on the plate speaks of authenticity, flavors and culinary evolution. Trust me, the ingredients are of the highest quality and you know it the moment you go for the first mouthful. I say it because I have digged in heartily. Classy as well as contemporary decor, pretty chandeliers, bright lights, open glass view, carefully selected paintings, neat table setup and old photographs at one corner of the wall, together lend a glowing ambiance to Artusi. The moment I walked in, I was impressed with its delighting credentials. Everything about it was prim and proper. In fact, I was immediately relaxed and looked forward to a great evening with hubby in the hub of the city. What is Artusi about? It is about culture, traditions and the cuisine of the Emilia-Romagna region, a beautiful part of north-eastern Italy. Honestly, I didn’t know about this region before visiting the restaurant. But it was enlightening to learn that this region is home to some of the famous products that are used in fine dining around the world. While the original Parma ham (Prosciutto di Parma) and Parmesan cheese (Parmigiano-Reggiano) are produced in the city of Parma, the original balsamic vinegar comes from the city of Modena, and the Bolognese sauce from the city of Bologna. All of this is located in the Emilia-Romagna region. 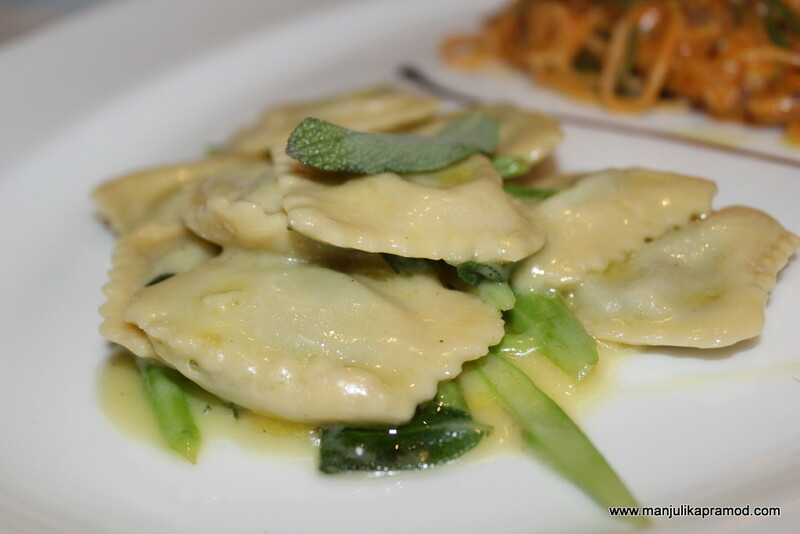 Not to forget, Emilia-Romagna is know for its home-made outstanding pasta creations too. Tortellini, Ravioli, Cappelletti, Strozzapreti, Lasagne, Tagliatelle are some of the very interesting varieties of pasta for there. Artusi restaurant is a tribute to the Emilia-Romagna, and to Italian food and wines. Emilia-Romagna is also the region where the restaurant owner, the chef and many of the products and dishes of the restaurant originate from. So there can be no second thoughts when it comes to authentic flavors. When it is served all fresh, delicious and of highest standards, whats not to like about it? The menu boasts of exciting dishes for an elaborate indulgence. As I read through, it was evident that the dishes were designed to combine fresh and choicest of ingredients to bring out the right aroma. Chilled soup of tomatoes and raw vegetables. Cheese and leeks quiche with melted mild gorgonzola. WHO IS Mr. PELLEGRINO ARTUSI? 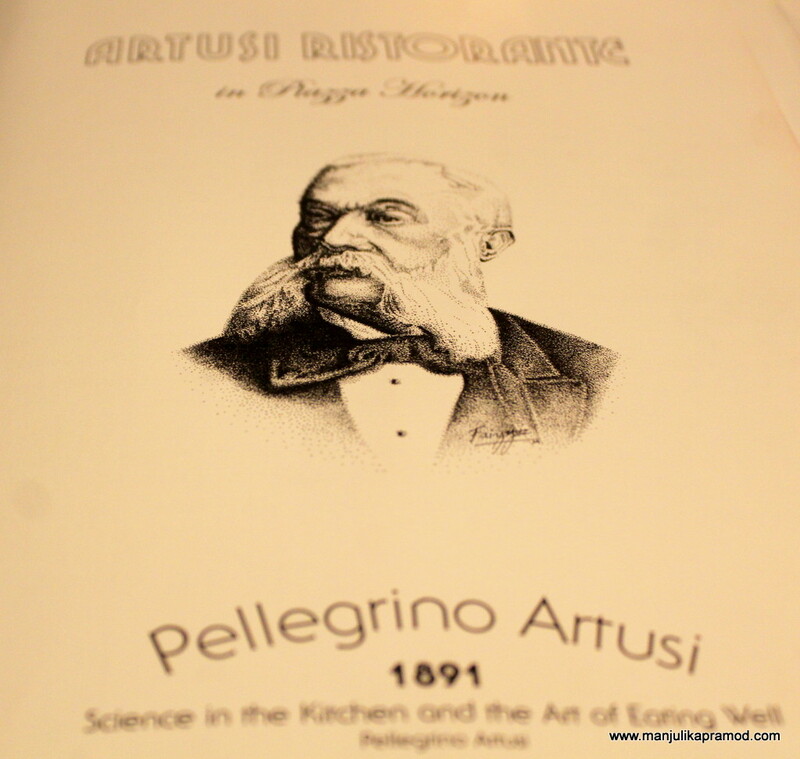 Mr. Pellegrino Artusi is considered the founder of the Italian cuisine by virtue of having authored a book in 1891 called ‘Science in the Kitchen and the Art of Eating Well’. His work is renowned as the first Italian cooking book written in the kingdom of Italy and has remained a culinary reference point for fine Italian cuisine around the globe since its first publishing. I also learned that it is revered in many regions of Italy. Globally, a number of restaurants specialize in Italian cuisine and they credit their inspiration to Mr. Pellegrino. Before visiting this place, I had not really heard about Mr. Pellegrino’s book. The GM of the restaurant was quick to bring the book to my table. Hubby and I read a few pages of the book over the delicious food that kept making its way to our table. We picked our favorites, talked around the lingering tastes and thoroughly enjoyed our Italian date. The traditional way for Italians to eat their meals differs from the ways a meal is consumed in most other parts of the world. In Italy people tend to take more time for a dinner or for a lunch. Italians eat many sequential courses of smaller size. Like, Pasta or Risotto are almost always eaten as separate courses as opposed to other countries where pasta or rice is often combined on a larger plate with fish or meat. Apperitivo and Antipasto -Italians often start a meal with an Antipasto or an Aperitivo. An Antipasto can be an elaborate plated entree, while an Aperitivo consists mostly of fine crostini topped with premium ingredients. A stimulating Italian Aperitivo Cocktail, or a glass of sparkling wine, is very common at an Italian Aperitivo. Primo Piatto / Secondo Piatto– The most noticeable difference between a traditional Italian meal and other dining experiences is that Italians do not have a “main course”. Instead they have a “Primo Piatto” and a “Secondo Piatto”, i.e. “first” and “second” courses. The “First Course” mostly consists of a Pasta or a Risotto dish only. The second course mostly consists of meats, fish, seafood, or a vegetables platter. Formaggi, Dolci e Caffé– The meal is concluded with either a sweet dessert or a savoury cheese platter. 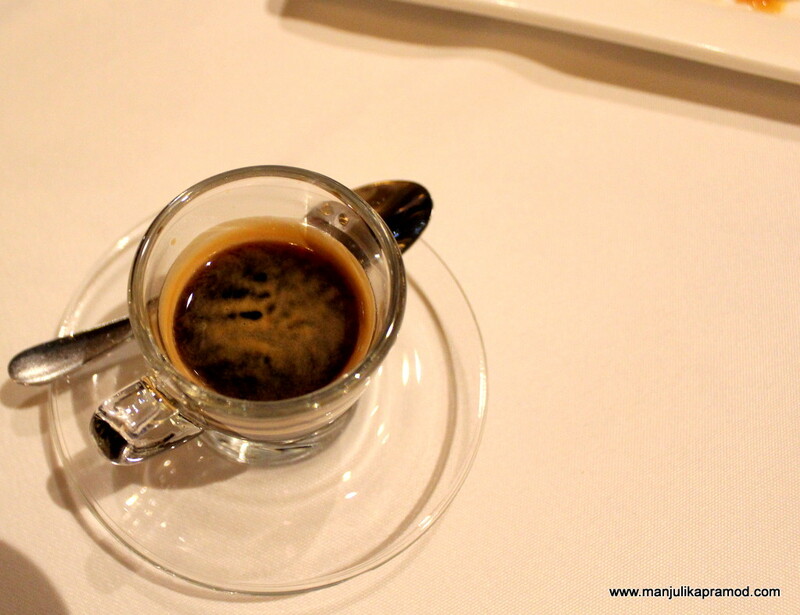 A good espresso coffee (which Italians simply call caffé) is rarely far away from dessert. Soup of Luxurious white asparagus finished with truffle oil. Soft cubes made from eggs and cheese cooked and served in chicken broth. 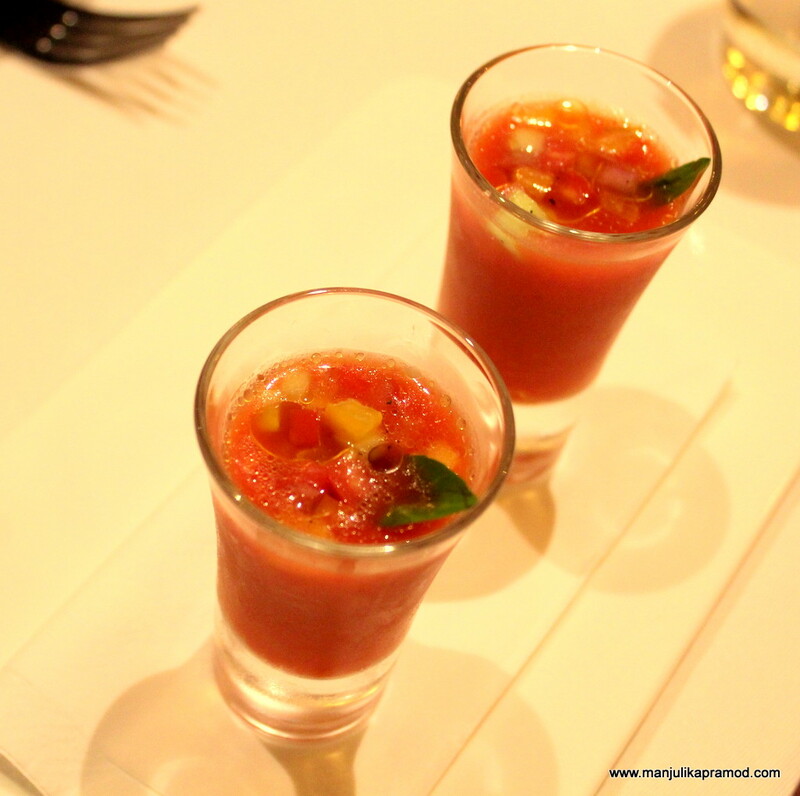 Amuse Bouche Gazpacho-Chilled soup of tomatoes and raw vegetables. 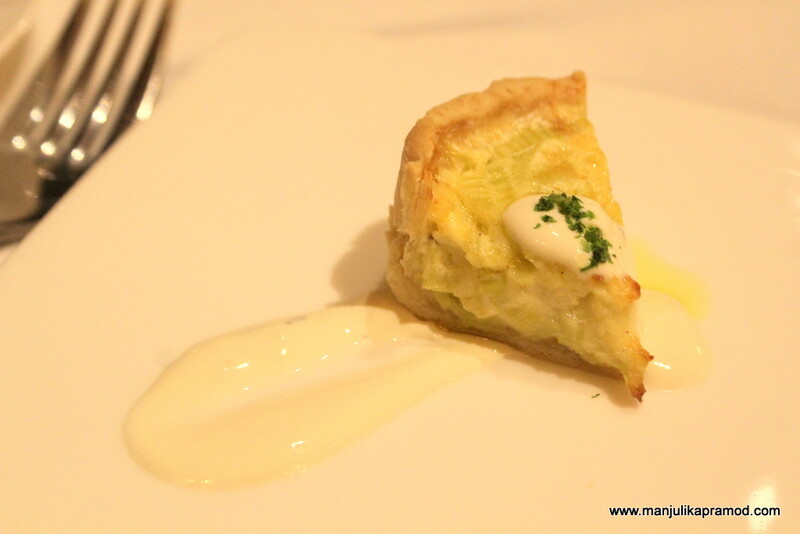 Tortino di Porri -Cheese and leeks quiche with melted mild gorgonzola. First came the soups as per our order! 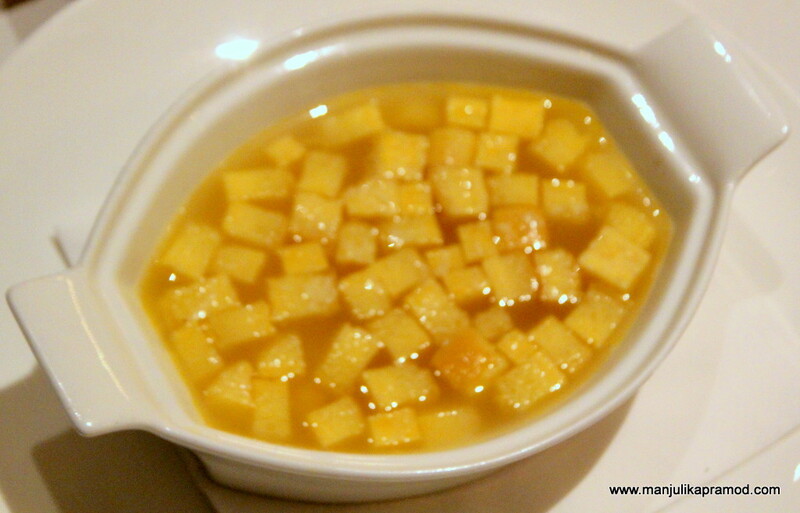 Zuppa Reale -Soft cubes made from eggs and cheese cooked and served in chicken broth. 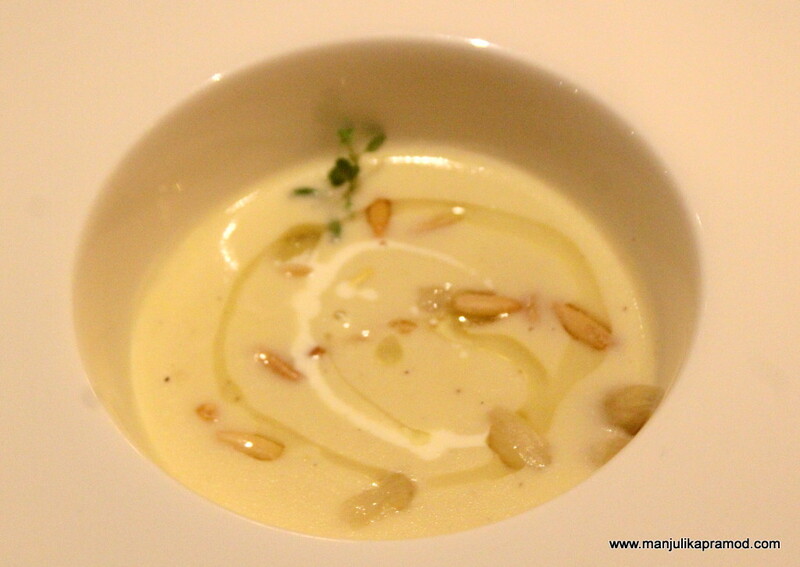 Vellutata di Asparagi Bianchi –Soup of Luxurious white asparagus finished with truffle oil. 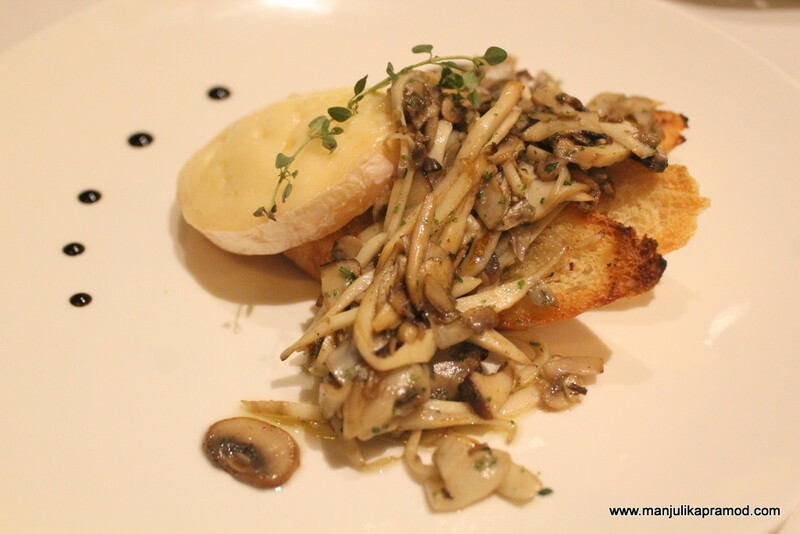 Finest imported soft cheese gently melting over toasted bread with sautéed mushrooms and Italian white truffle oil. Ferro Rocket leaves salad with grapes, raisins, pears and goat cheese with pine nuts finished in EVO and balsamic vinegar. Tomino – Finest imported soft cheese gently melting over toasted bread with sautéed mushrooms and Italian white truffle oil. 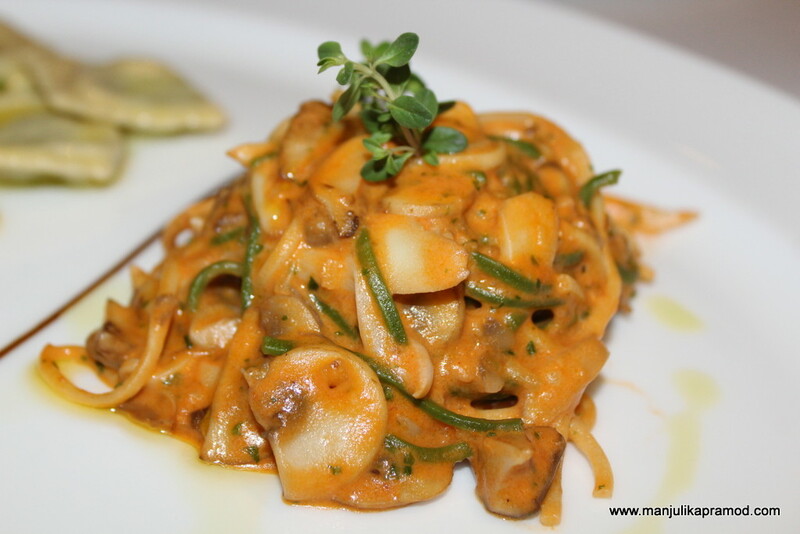 Paglia Fieno – Angel-hair noodles set in tomatoes, cream sauce with shallots and mushrooms. Ravioli Pasta pockets filled with spinach and ricotta set in butter sage and asparagus sauce. Risotto e Frico Romagnolo – Risotto of luxurious Carnaroli rice finished with Parmesan cheese served with diced stewed vegetables. 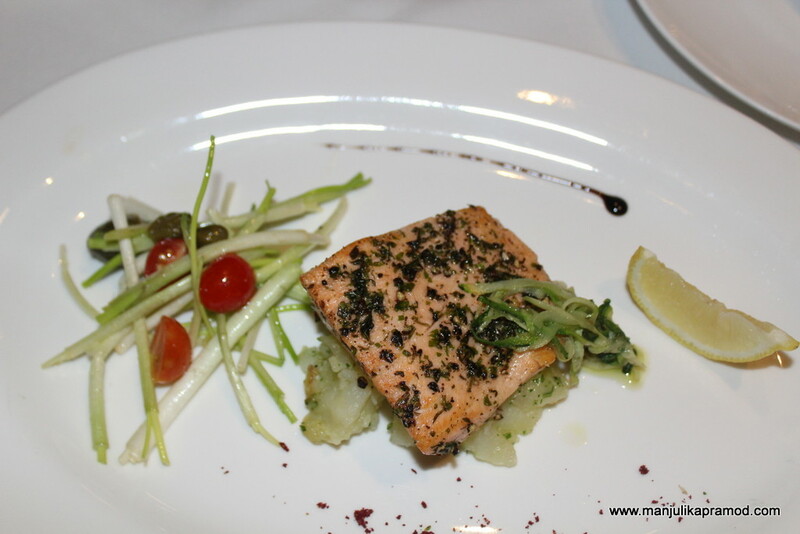 Salmone – Grilled Salmon in a crust of aromatic herbs, served with sautéed zucchini and squashed potatoes. Grilled Salmon – I had asked for a smaller portion! Fifth and final – You just can’t miss their signature dessert! 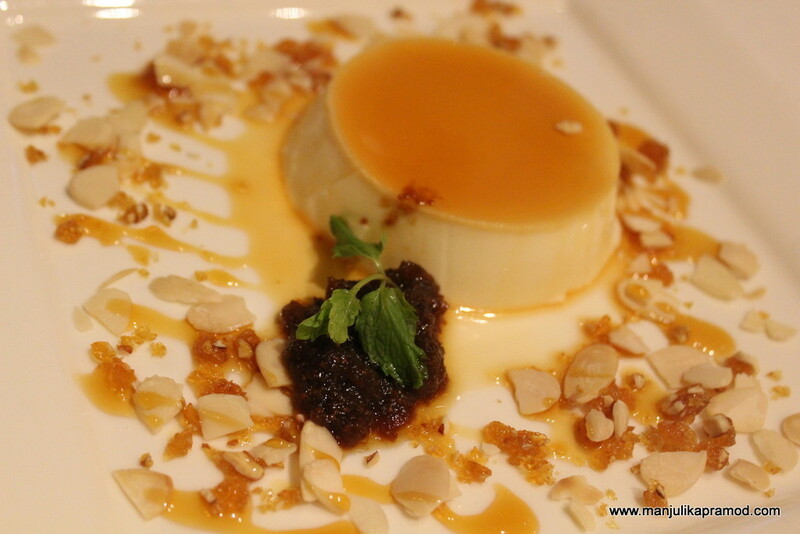 Panna Cotta – -A dessert that is about home-made figs jam and almond slivers. First thing, I really really loved the good vibes of the place. Everything about the food gave me a very filling and oh so satisfying kind of feeling. The flavors were new and very pleasing. Initially, I had my apprehensions about the pricing on the menu but later when I understood the whole concept of Artusi and how the owner had genuinely attempted to give us the best from Emilia-Romagna region, I had no doubts about anything. Be convinced, whatever you pick, you are in for a real treat. If you can’t decide, the expert staff will also help you choose as per your liking. Hubby and I were game for recommendations and it kind of worked for us. We tasted salads, soups, two different varieties of pastas cooked in different style, rissoto and more. If you would like to take my suggestions, go for the Amuse Bouche Gazpacho, the Ferro salad, sauteed mushrooms, Ravioli Pasta pockets filled with spinach and the grilled Salmon. And do keep some room for the desserts. You can pair your small meals with traditional Italian drinks and enjoy the evening as a popular trend in Italian cities where diners relax with a drink and a satisfying meal.